Inspired by our favourite comedy clip, January was all about two soups. Or soup two ways. 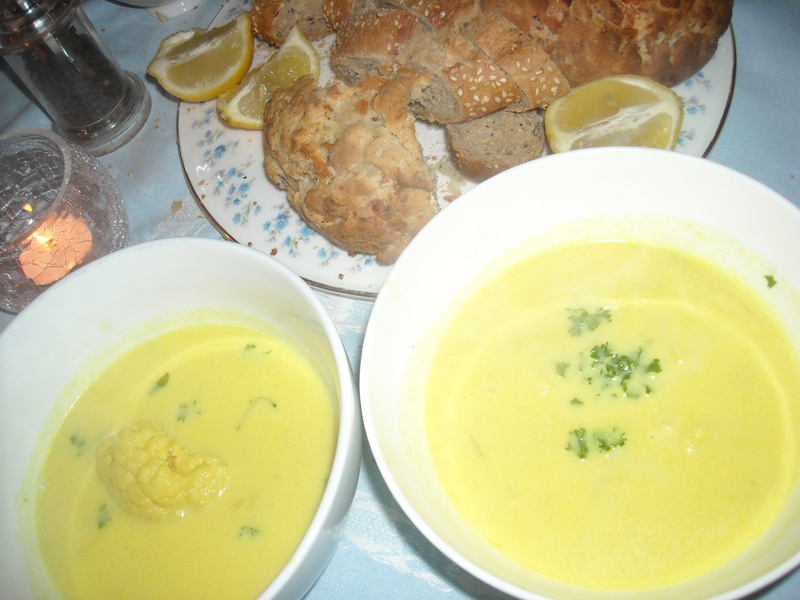 Two ways to make tasty, healthy, nourishing soup to warm your cockles. Halve the tomatoes. Slice the peppers and onions into big chunks. Peel the garlic. Peel and grate the ginger. 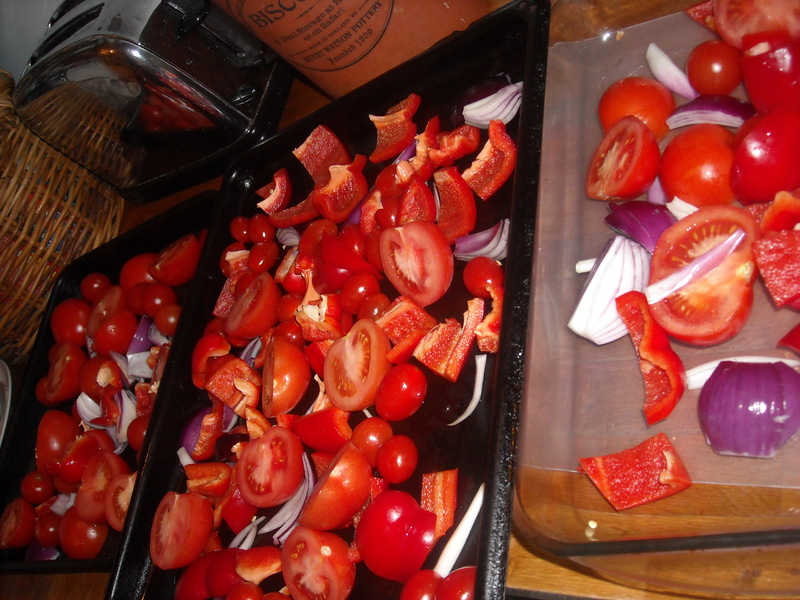 Sling the tomatoes, peppers, onion and garlic in a single layer on two or three baking trays and splash with olive oil. Give it a shake and put in oven at 200/Gas Mark 6. Roast for 30 mins til tender then tip into a big saucepan and blitz with a hand blender. Add the ginger, a couple of splashes of soy and Tabasco, black pepper and enough water to make the consistency you prefer. Whizz and taste adding more soy, Tobasco or pepper as it needs. Warm through and enjoy virtuously. This is a warmingly sweet bowl of redness. If you wanted a bigger chilli hit you could add a couple of red chillis at the roasting stage or just serve with Tobasco on the side to add to taste. We ate ours with some of our Lemony Pepper Bread (recipe here) but it would also make a great risotto base in place of stock. Melt the butter in your biggest pan (or split between two pans to start with like we did). Add the onion, garlic, turmeric, fenugreek, ginger and soften. Add the cauli, put the lid on and cook for 5 mins on low til everything softens. Stir in the almonds then add boiling water til the cauliflower is almost covered, replace lid and simmer for about twenty mins til the cauliflower is tender. Stir in a litre of milk and then blitz until smooth and satiny. Add more milk if you want it thinner. Now taste and add lemon juice to freshen it up and black pepper to taste. Warm through then serve with lemon wedges and some chopped coriander on the top. Our taste buds were zapped after the tomato soup so we really need to try this again without a tomato starter but the overall effect is quite nicely korma-ry. The lemon added at the end definitely spritzes the taste up a notch and some toasted flaked almonds on the top would have been good too. Again, this ingredients list makes a large quantity but it’s easy to scale it down or freeze batches of extra soup. We drank… Moscow Mules – continuing our gingery theme – a mix of vodka and freshly squeezed lime in a tall glass topped up with ginger beer. We talked about… school dinners, graphene, second hand furniture at the Phyllis Tuckwell Furniture Showroom, the 5-2 diet and fasting, Brian Cox, Les Mis, Matthew Bourne’s Sleeping Beauty at Sadlers Wells, science GCSEs. This entry was posted in soup and tagged almond, caulifower, cocktails, food, ginger, La Culinari, lemon, pepper, soup, spicey, tomatoes, turmeric. Bookmark the permalink. These soups look wonderful! I love adding ginger to my dishes! Thanks for your comments. Try the gingery cocktail too, delish! 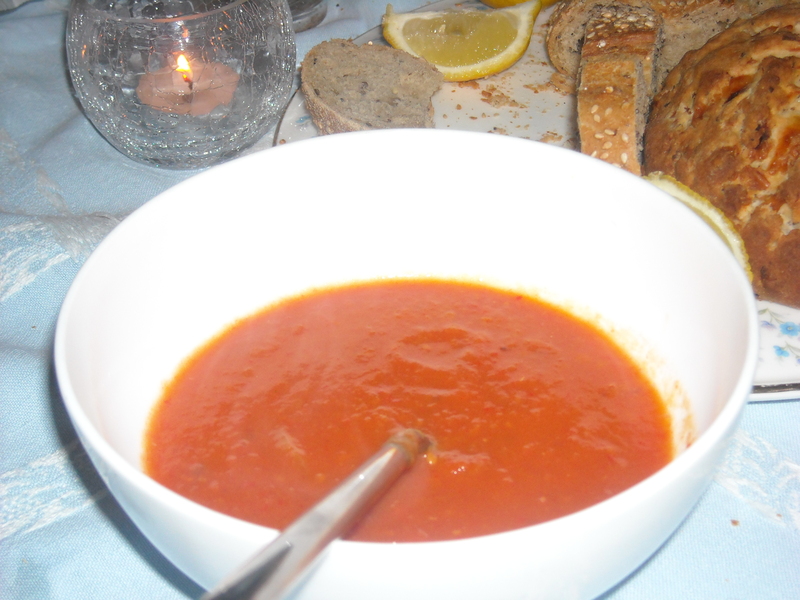 Hmm I have friends staying soon so will try out the Tomato Ginger Zinger – quick but tasty – sounds perfect. I made mincemeat for the first time at Xmas with your recipe – came out well and put some in small jars for presents. Cheers! Cheers to you too! Hope your guests enjoy the soup, we LOVED it. Sue also used it as a sauce for meatballs with pasta and said it was “meatballtastic”. It’s a good one to make in massive quantities and freeze in batches. Bon appetit!